I had a busy weekend celebrating one of my best friends on her upcoming nuptials. We had a full weekend planned of dinners, festivals, and libations. It was a lot of fun, but not quite WW friendly. It also didn't leave my any time to get by my meeting. So, instead of checking in, I'll share a little bit of our fun from the weekend. Paige, her sisters and I had a wonderful dinner at 98 Bistro. Tu, the most gracious restaurant owner and hostess with the mostess, kept the drinks flowing and we enjoyed everything from Larb to Lettuce Wraps. It was a fairly early evening for me since we had big plans on Saturday. Five of us travlled to Salisbury for Hippie Fest. I'll be honest, I didn't think this was going to be my thing, but we had SO much fun! Picked up two new tie dyes from Corndog Tie dyes. I've vended with him before and my friend, Liz, was working with him so two birds. And I supported fellow artists, which I love doing. We arrive shortly after lunch time. Checked in (the event was sold out, but honestly, there was plenty of room for more). Right off the bat, we met a kind gentleman with a 6-seater golf cart who drove us directly up to the gate. Super nice and he gave us a fabulous recommendation for lunch. First things first....we needed a beverage--you can't drink all day if you don't start in the morning--and we wanted to sip and shop! We were looking for tie dyes, of course. We've all been Grateful Dead fans for years, so we weren't sure what we might find, but there were plenty! We made the most of our excellent hippie adventure, though, and took every photo op around! After our first round down an aisle or two, it was hot and we needed an ice cold beverage. Ran into our golf cart driver and he pointed us in the right direction for some yummy, fresh squeezed lemonade. As we stood in line, I looked at Paige and said....that Dill Dog looks amazing. She agreed, so we got a large lemonade and split a Dill Dog. Let me tell you, I haven't STOPPED thinking about this since then. I'd like to have one right now. It was so amazing. A hot dog, inside a giant Dill Pickle, fried in corn bread for the most magnificent corn dog you've ever eaten. Back story, I love corn dogs....and really any type of Fair Food. Oh, and Trix bought us matching visors.....so look out world, the old Dead Heads are back! Our Matty would love these. The evening starting with dinner at Fixin's on North Main in High Point. It was my first visit there, so I was excited to try their burger. It was excellent, as were the fries. The beer was cold, and the friendship and laughter was plentiful! I'd love to say rounding out the night at Brown Truck Brewery, but this was just the first stop..... Davis Tucker, a local favorite was there playing our favorite songs. 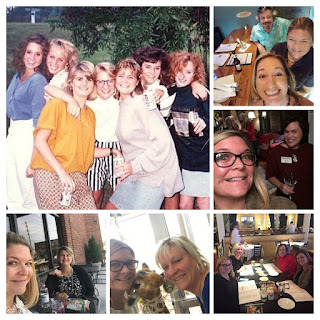 We enjoyed some of the best beer in North Carolina (BTB is award-winning, if you aren't familiar with them), more laughs, dancing, and, well, some fun items that were brought for the bachelorette party. How was your weekend? My week is going to be getting back on track and tracking points like a rock star.....instead of acting like one!